Yolanda Carter comes from a family of artisans and lives in her deceased grandparent's cottage in Sherman Oaks, California. She works at a small cat shelter but dreams of owning a bakery. Her friend from high school, Teagan Mishkin, knows that Yolanda needs money and suggests better paying work as a cocktail waitress. The interview takes an unexpected turn and she stumbles across a scheme to close down the cat shelter. Yolanda Carter loves to show her creative side with her delicious pastries. That and her cat friendly treats (home made, of course). Yolanda dreams of one day opening Yolanda Yummery's. For now, Yolanda's clients are the cats at the cat shelter. Yolanda learns that the cat shelter might be going soon. Yolanda knows she has to do something to save the shelter. She decides to have a brownie taste off. Yum, who doesn't love a fresh, warm, home made brownie. I know I do. This book was a sweet, quick, read. I like Yolanda. I just wished that she was more assertive. Even towards the end of the book when she got her dream shop, she seemed passive. I hope she stands up for herself more and finds her voice in the next book. Also, I don't know what will happen between Yolanda and her boyfriend, Zac but here is Yolanda's chance to be strong and kick him to the curb. 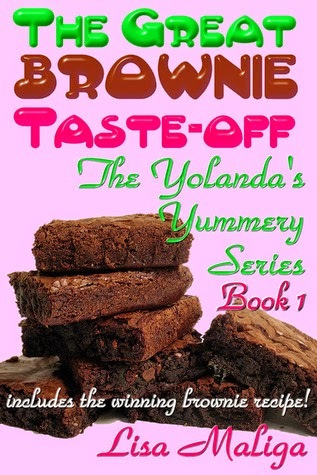 Lisa really does know how to cook up a yummy read with The Great Brownie Taste-off!